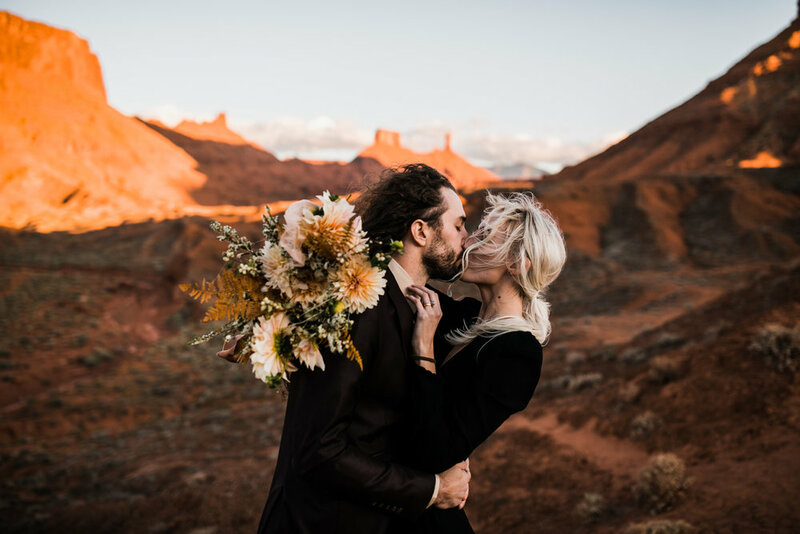 If you follow us on instagram, you're probably aware by now that Moab, Utah is our favorite place to play, explore, hike, skydive, etc, and you've probably realized it's also our favorite place to photograph adventure engagement sessions, weddings, and elopements too. So it should be no surprise that these photos of Ray + Weston in the desert outside of Moab are some of our favorite adventure photos yet. These two are so adorable together and we had so much fun with them! 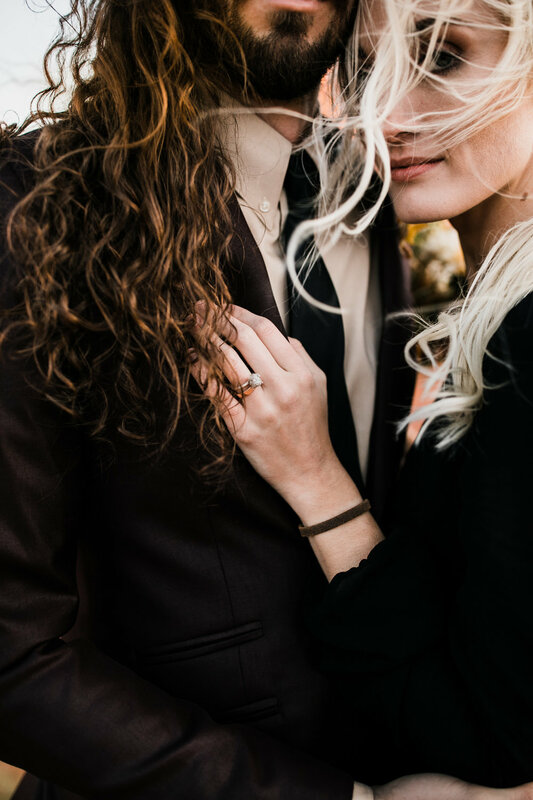 I also can't say anything else without mentioning the incredible Val Hunter of Tellurian Events, who planned and styled this entire day. Aren't those florals amazing?! And Lesley Lind, who did Ray's hair and make-up, which perfectly complimented the moab desert landscape. Weston also handcrafted their gorgeous rings! You can find his website, Rose Anvil, here. 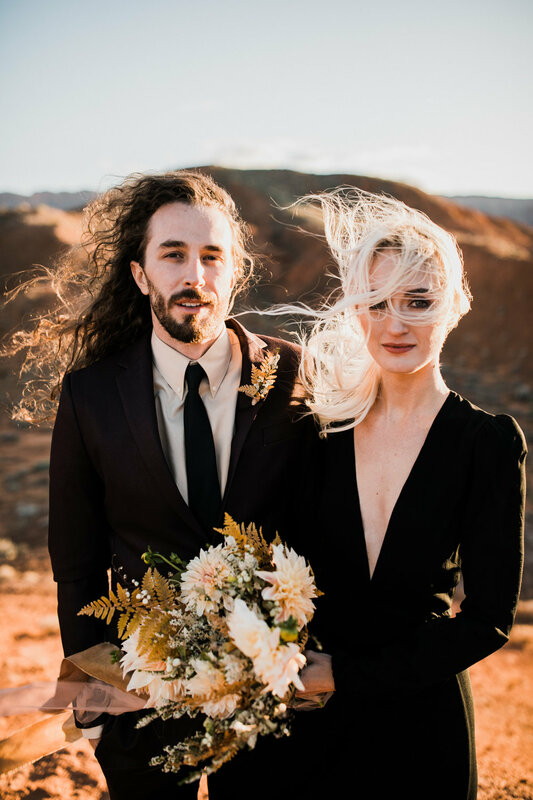 We had so much fun working with everyone involved creating this absolutely perfect adventurous elopement in Castle Valley, which happens to be one of my favorite places in the Moab area. 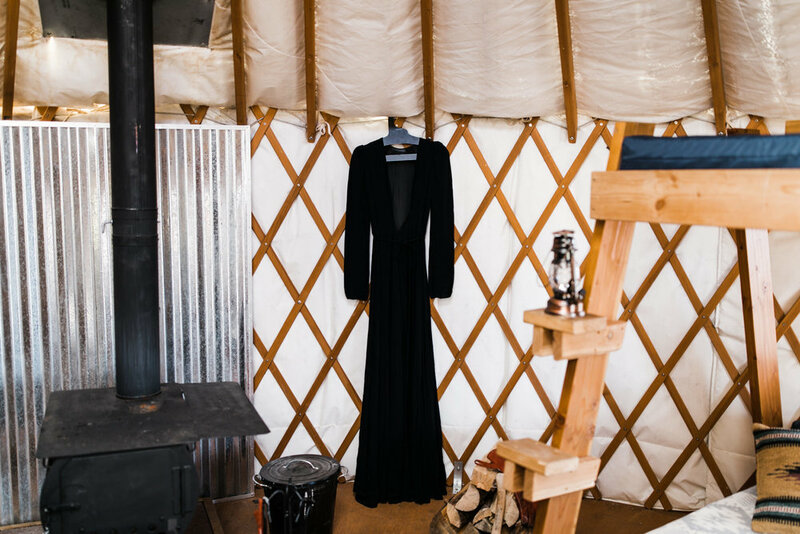 They got ready together in a yurt up in the La Sal Mountains overlooking Castle Valley - compliments of Talking Mountain Yurts, and then we headed into the desert to a little hill surrounded by some of the most stunning mesas in the Moab area. It was insanely windy, which just made these two look even more glorious. Weston + Ray are serious #hairgoals. The sunset was gorgeous and we were even treated by about 20 skydivers doing an off-site jump for the Skydive Moab Boogie nearby! Overall, it was such a sweet + rad day. 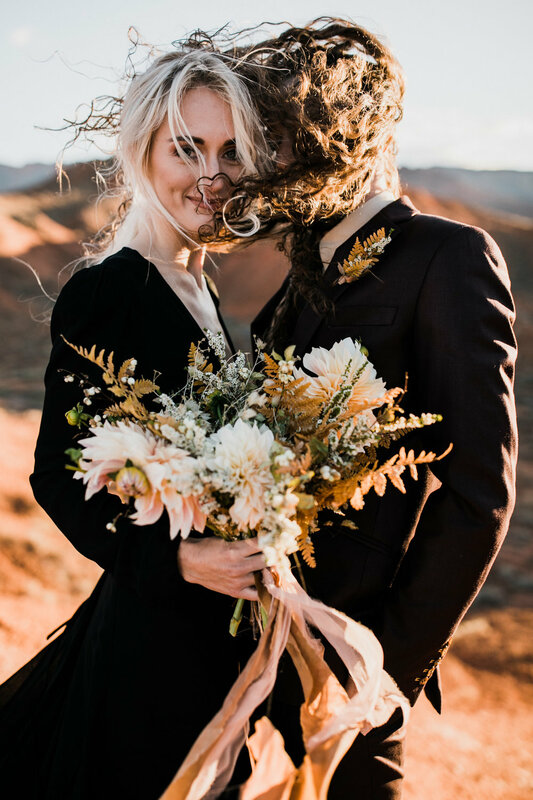 If you're considering eloping somewhere unique, Moab is honestly the best place. We spend a majority of our nomadic life here, exploring every corner of the desert around Canyonlands and Arches National Parks, Bears Ears National Monument, and the BLM lands in between. 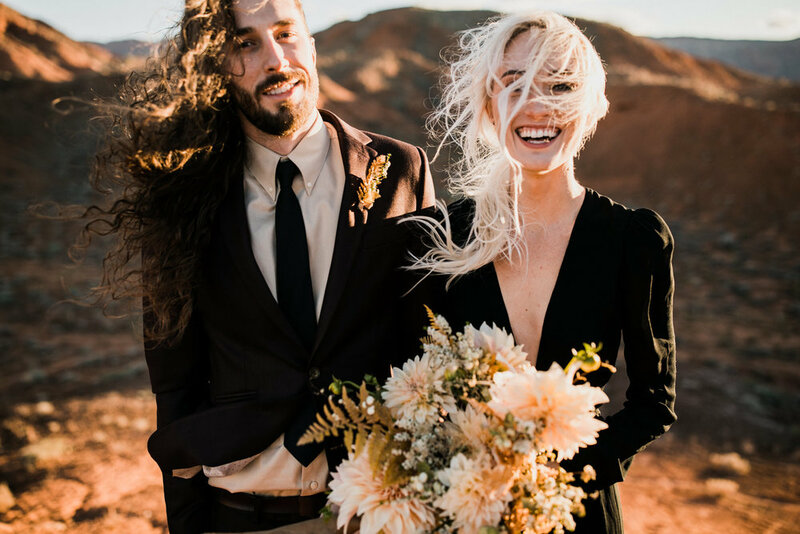 We have a always-growing list of perfect places for cliff-side intimate weddings, adventurous hike-in elopements, and stunning portraits all over the Utah desert.